WASHINGTON - Donald Trump's son-in-law and senior aide Jared Kushner has lost his top-level security clearance, sources familiar with the matter said Tuesday, a decision with potentially profound implications for the US administration. Two sources, who could not speak on the record because the status of security clearances is classified, confirmed US media reports that the 37-year-old White House aide will no longer be able to access America's most closely protected secrets. The White House -- up to and including the president himself -- refused to comment on the record, but officials insisted that the decision would not have any impact on Kushner's role. Still, Kushner's loss of access to "Top Secret/SCI (Sensitive Compartmented Information)" casts serious doubt on his status as a powerbroker inside the White House and his ability to negotiate Middle East peace. The soft-spoken aide is married to the president's daughter Ivanka Trump and has been a leading figure in efforts to reach a peace deal between Israelis and Palestinians. Kushner's lawyer had earlier admitted that he has not yet completed the formal clearance procedure, despite reportedly getting access to the most secret material contained in the president's daily briefing -- the crown jewels of US intelligence. Kelly has told Kushner he had "full confidence in his ability to continue performing his duties in his foreign policy portfolio including overseeing our Israeli-Palestinian peace effort and serving as an integral part of our relationship with Mexico." He put himself firmly in the sights of special prosecutor Robert Mueller after secretly meeting Russian ambassador Sergey Kislyak and Sergei Gorkov, a banker with ties to Vladimir Putin as well as attending the notorious "Trump Tower meeting" with a Kremlin-connected lawyer. On Tuesday, even before the stunning news broke, close Kushner advisor Josh Raffel announced he was leaving the White House and Kushner was accused of breaking the "Hatch Act" which forbids, among other things, White House aides using their official titles in campaign statements. And later on Tuesday the Washington Post reported that at least four foreign governments -- the United Arab Emirates, China, Israel and Mexico -- had wondered how to leverage Kushner's business and political vulnerabilities. That sparked several calls from lawmakers, including Congressman Ruben Gallego, who took to Twitter to ask "what DOES Jared have to do to get fired?" The answer to that question remains unclear. Since the first days of this administration, Trump has seemed to believe there was no challenge too confounding, no conflict too intractable for his son-in-law to tackle. 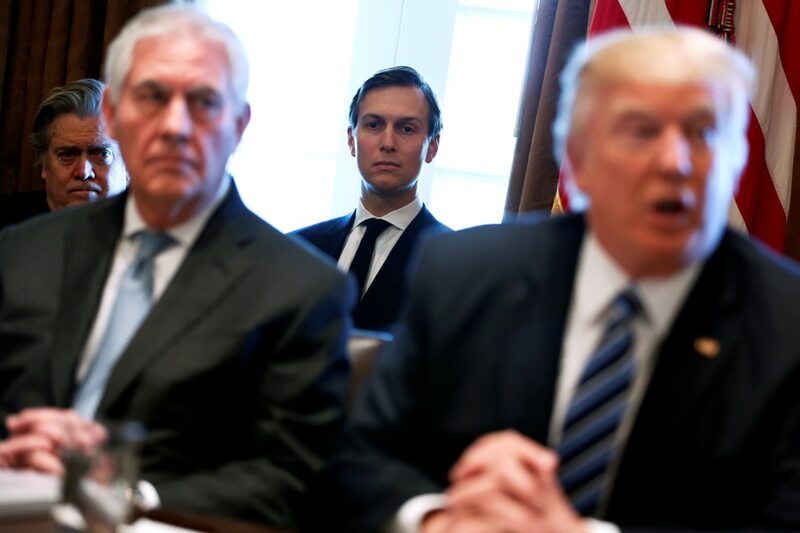 Beyond resolving the Israeli-Palestinian conflict, Kushner was handed a to-do list that included solving America's opioid epidemic, prison reform and injecting the nation's bureaucracy with entrepreneurial spirit. In person, Kushner is polite and self-deprecating, offering little of the hubris the president has shown about his abilities. "Jared's done an outstanding job. I think he's been treated very unfairly," Trump said just last Friday. "He's a high-quality person. He works for nothing, just so -- you know, nobody ever reports that, but he gets zero. He doesn't get a salary, nor does Ivanka." But Trump also indicated the decision on Kushner's security clearance would be up to chief of staff Kelly. "He's going to do what's right for the country. And I have no doubt he'll make the right decision," Trump said.